Shimmering Lake Havasu, the centerpoint of Lake Havasu City, was formed in 1938 after the Parker Dam was built. 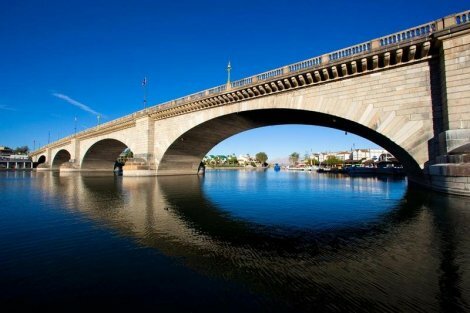 It is perhaps most famous for the London Bridge that looms above it. Yes, the actual London Bridge, bought by the area's founding father, Robert McCullough, for $2.5 million, after the city of London put it up for auction in 1968. Today, Lake Havasu City is one of the most popular vacation destinations in Arizona and offers a range of recreational activities for families, couples and single travelers. Golf on championship courses, soak up the sun on the shores of Lake Havasu's beaches or explore nearby parks by foot and bicycle. Houseboats dot the lake and are available for rent along with paddle boats, kayaks, jet skis and other types of water sports equipment. Like most resort towns Lake Havasu is chock-full of hotels, restaurants, shops and non-stop action. Bullhead City, AZ and Laughlin, NV are located just 1 hour north of Lake Havasu City along the Colorado River. Continue north another 1-1/2 hours and you will be in Las Vegas! 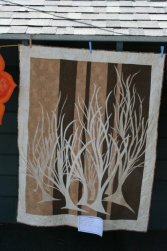 Coming to the Tri-State Area for a Quilt Retreat? 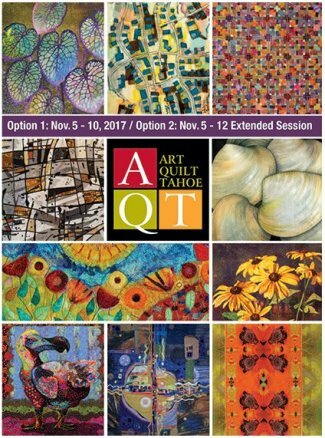 If you are an Art Quilter or Fiber Artist, then Art Quilt Tahoe is for you. Held at Zephyr Point Presbyterian Conference Center on the shores of beautiful Lake Tahoe, this retreat boasts some of the most talented and creative artists and teachers in the country.Click here or go to www.ArtQuiltTahoe.com for more info and to register.